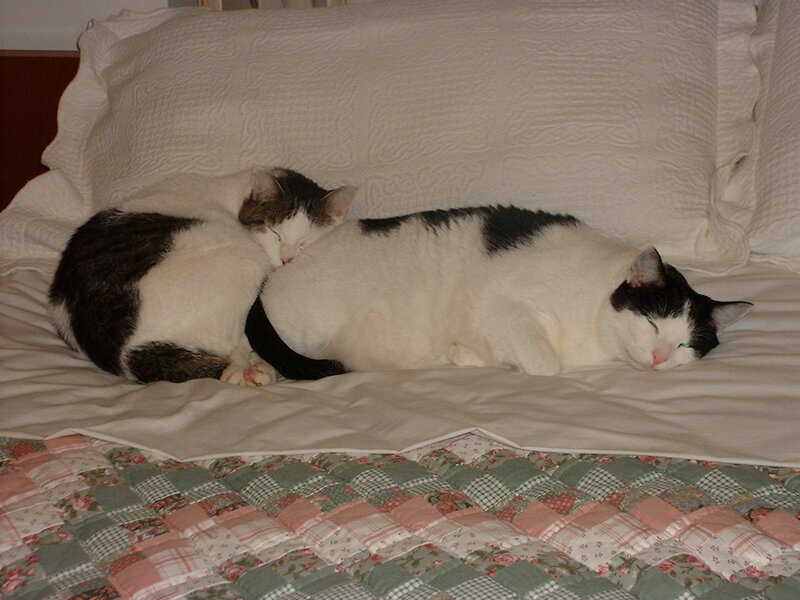 As friends of mine and readers of the site know, we had two cats here in my house: Ringo and Gus, two brothers we got from the same litter. Well, over the past few months, both of them succumbed to old age, and as a result the house is just a little bit lonelier. They had long wonderful lives with us, and we will miss them. Still, it’s funny to think that we almost didn’t get them at all. Back in 1994, my ex-girlfriend Malinda’s family had a stray cat start camping out in their back yard. They started calling the cat “Tessa” (short for “Phantessa”; she was on an Andrew Lloyd Webber kick), and while they didn’t let her into the house, they did feed her. Well, there was another roaming cat nearby that they called “Big Ugly”, and pretty soon Tessa was pregnant by Big Ugly. Before long, Tessa had given birth to a litter of four kittens. Malinda’s family helped Tessa through the pregnancy and labor, and now had a conundrum: what would they do with the kittens? Malinda remembered that we had just lost our cat Missy and dog Franny recently, and called me to ask if we wanted any of the kittens. Dad was adamant we weren’t getting any, but Mom wheedled him into going to Malinda’s house to take a look at them. While we were there, Mom took what she considered the cutest of the four, Ringo (so named because his tail had ringed markings like a raccoon), and placed him on Dad’s shoulder. Ringo took to Dad immediately and bonded with him, and as a result Dad agreed to take two of them in. Ringo was the obvious first choice, but we didn’t know who of the other three to take. Mom finally decided on Gus (named after Gus the Theatre Cat), simply because she felt that he was the ugliest of the kittens; with his scrawny frame and crossed eyes, Mom didn’t think he stood much of a chance to be adopted. The choices made, we eventually came back a couple of days later after preparing the house and brought them home. Unfortunately, Tessa and the other two kittens did not have quite such a happy ending, or we assume they didn’t. They disappeared from Malinda’s yard a week and a half later, and were never seen again. 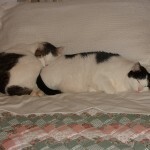 For the most part, they ruled the house for a long while, except when new arrivals would come. 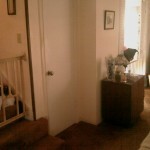 When we got our malamute Cody, they took one look at him and took off upstairs. They stayed upstairs for at least a month or two, until such time as they finally decided to be brave enough to come downstairs and finally interact with Cody. For his part, Cody was the sweetest, most unassuming dog, so he mainly regarded the cats with bemusement. Gus had no problem interacting with Cody. Ringo, on the other hand, always regarded Cody with fear, and so kept his distance at all times. Gus and Star have an unseen confrontation. In 2004, however, things made a permanent change. We got another dog named Star, and we quickly learned Star was not cat-friendly. 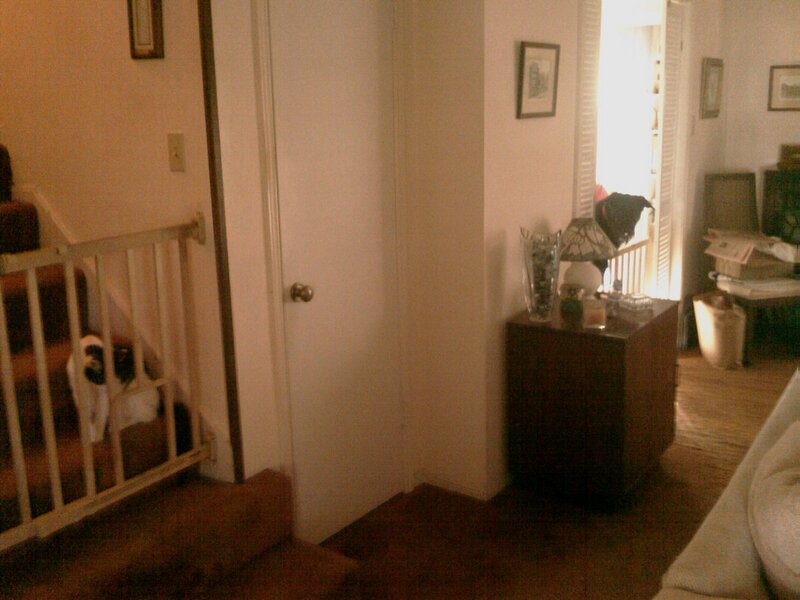 We ended up putting up a system of children’s gates, to keep the dogs in the kitchen and the living room so the cats could remain upstairs undisturbed. We weren’t worried about the cats, as we knew they would keep their distance from Star. We just didn’t want the dogs to easily get to them. Ringo, for the most part, kept away from the dogs. Gus, however, did not have a problem with making his presence known to Star and driving her into a frenzy. For example, he’d go into the living room just far enough for her to see him, and when she started going bonkers he would just lay there and watch. Unfortunately, all good things must come to an end. A year or two ago, Gus started developing an issue where he started losing weight at a rapid rate. The vet diagnosed him with thyroid problems, and so we put him on medication (which we gave him with tuna) with the understanding that this would keep him going, but it wouldn’t always work. Well, back in December, he lost his appetite again, and started losing weight. He also started developing breathing problems. We knew he was in absolute misery and decided that it was time to let him go, as he was drooling, dehydrated, and having severe breathing problems. We made an appointment to take him in the next day… but at around 6:15 AM, he died on the steps. We were heartbroken, especially for Ringo, who had never been without his brother. For his part, Ringo became more assertive and loud, even though he still didn’t reach Gus’s levels of intensity. Also, while he had less problem being fussed by me, he still refused to come into my room. Unsurprisingly (with Gus and Ringo having been littermates), Ringo developed a lack of appetite, and by this past Friday he started having the same breathing problems Gus had. Mom had to take Taz (our third dog) in for a vet appointment Saturday morning, and as the vet knew there was nothing that could be done for Ringo, they decided to bring him in in the afternoon to have him put to sleep. Otherwise, he would have cratered like Gus did and been absolutely miserable, so we wanted his passing to be easy. Mom and Dad brought him in, and he passed very quietly and smoothly. It’s difficult getting used to the house without the cats. More than once I left my bedroom door open out of habit (so the cats could visit), and as a result the dogs would use their new-found freedom to go upstairs to rummage in my room. It’s also weird not saying hi to the cats when I go upstairs (as they would frequently be on the landing), or having them want to be fussed when I come out of the bathroom late at night. We’ve decided not to get any more cats, as with still having cat-unfriendly dogs it wouldn’t be fair on them. We loved the little rascals, though, and will miss them terribly. Here’s hoping that when it comes our turn to move on, they’re waiting for us alongside our other passed pets on the other side.